LUCKLESS David Gray faces a battle to play again this season after the Hibernian captain was ruled out for up to four months with an Achilles injury. 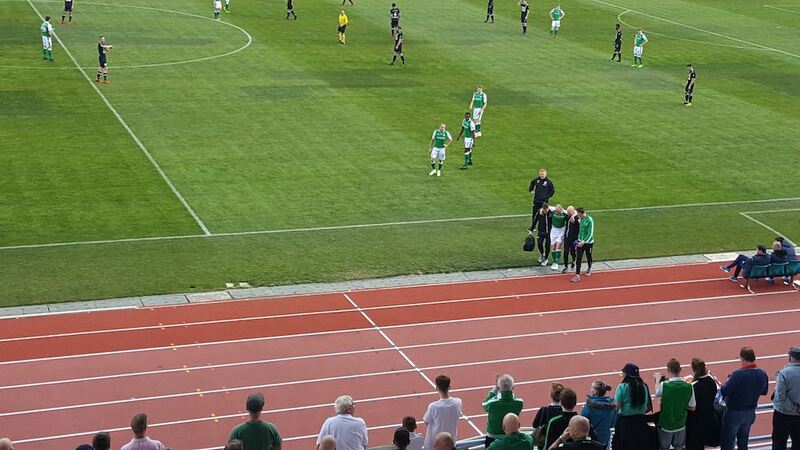 The 29-year-old suffered the damage just eight minutes into the capital club’s friendly against Willem II in the Algarve last Friday and was immediately confined to a protective boot, with boss Neil Lennon describing the incident as ‘heartbreaking’. After returning to Scotland 24 hours later, Gray was sent for a scan on Monday morning and sources at Easter Road have confirmed that the experienced defender is set for a lengthy spell on the sidelines. The best case scenario would see Gray back in action within 12 weeks, however it is more likely that he will not be fully fit until the middle of May – effectively rendering the remainder of this campaign a write-off. Hibs chiefs remain unsure whether an operation will ultimately be required to rectify the damage, with doctors recommending a period of rest before a decision is made on that more drastic course of action. It is a hammer-blow for the ex-Manchester United, Burton and Preston man, who was hopeful of playing a pivotal part in the second half of the season after recovering from the persistent knee complaint which had kept him out of the side since November. Gray’s absence also poses a headache for Lennon, who is down to the bare bones ahead of this Sunday’s Scottish Cup visit to face Hearts. Steven Whittaker has been plagued by pelvis problems this term, leaving Efe Ambrose to deputise at right-back. Meanwhile, highly-rated Hibs midfielder Scott Martin has extended his loan deal with Arbroath until the ends of the season. The 20-year-old, who has already made 14 senior appearances for the Hibees, scoring once, has been a stand out for the Red Lichties since joining in November, helping them rise to third spot in the battle for promotion from League 1.